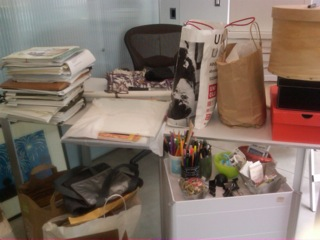 This is my desk. "How do you get anything done?" you wonder. I wonder that same thing myself. 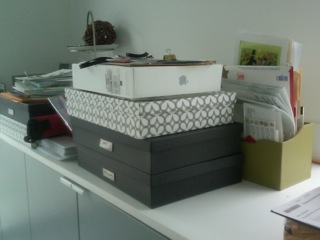 This is my filing system. 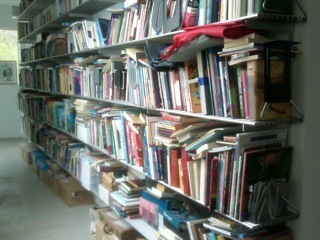 These are my bookshelves. Alphabetical order, by genre, until...they stop being that way (about 50 books in). Now you understand why I was reluctant to share a post for this blog, ignoring months of Amy's requests to send something. 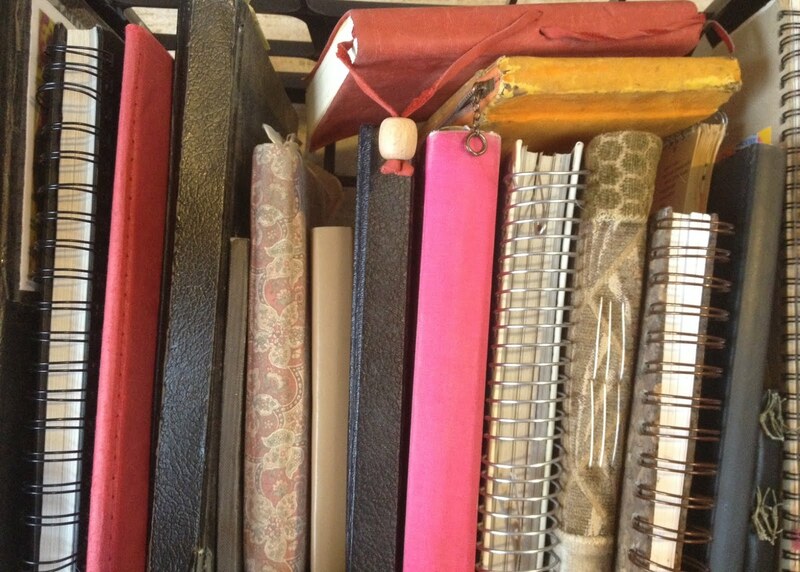 Other writers have gorgeous journals kept contained between handmade paper covers, tied with string, arranged by decade. This is mine. Actually, these are the contents of a file folder pulled at random from a paper bag on the floor of my office. 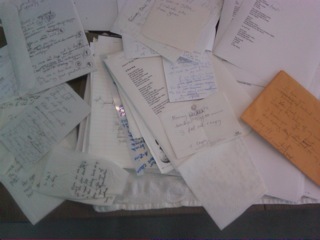 Most of these scribblings -- on hotel note paper, napkins, used envelopes -- come from 1997. I know this only because, mixed in with all that messy stuff, there are manuscripts typed up from the most promising of those notes. I should have gone through this file (and the dozens like it) about ten years ago. I should've boxed all this stuff up and sent it to the Kerlan or another of those glorious repositories of creative detritus. But each time I try to sort, I get distracted: "Wow! I like this idea. What if...?" The next thing I know, four hours have gone by, I've tinkered with some words, gotten wrapped up in another dozen possible poem drafts or story paths, maybe moved something from a scribbled page to a typewritten one, but finished nothing (interrupted by the constant bing of my Inbox and my Pavlovian need to see what causes the binging). A dozen bings (and three peeks at Facebook) later, it's time to run to the post office, deal with a contract, scan a cover, wash mud off the dog, chauffeur my son (well, that used to be the routine for a few hours each day; he's now in college), cook dinner, and smile at my husband. The file gets dumped back in the bag. Pulling this stuff out this week was like pulling teeth. And so, in honor of teeth, let me share a poem about flossing. 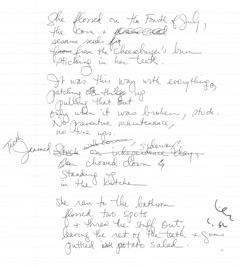 Here is the first draft (from the file) and, below it, another draft, picked and polished clean. from mowing down rows of corn. caught in between her teeth. What kind of a house doesn't have floss? but she thought this was a decent family. are puttied with potato salad, but you can't tell. And, well: it has to be this way, doesn't it? pull that out, do triage on trouble. the glue, the wire, the floss. a fine line between peace and crazy. * If it's long, cut it in half. * If it's short, double it. * If it rhymes, take all the rhyme out. * If it doesn't rhyme, try using some rhyme. Or better yet, try some off-rhyme (teeth/relief, released/peace). * If the first poem is serious, make the second one funny. * If a poem talks about someone ("he" or "she"), change the voice (use "I". See what I did using the poem that I just shared with you. "A Fine Line Between Peace and Crazy." Re-read it (above) and now read my "inside-out" draft (below). I've got corn caught in my teeth. Where's the floss? I need relief! I know...pluck! I'll use a hair. I don't look bald now, do I? There! The corn is gone. It's been released. One less hair, but I've got peace. I think I like the serious long draft better, but I also like my use of the word "released" in this short draft, and I might want to experiment a little more with the idea of an old woman who is so desperate for relief that she would pluck a hair from her balding head. What do you think? 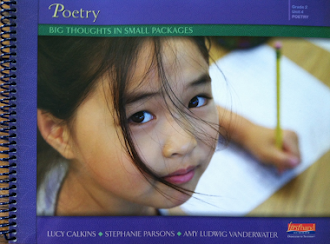 Are you ready to try an inside-out poem of your own? 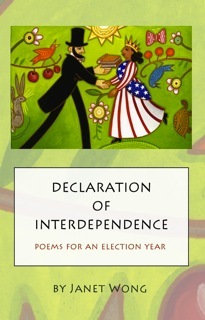 Janet Wong is the author of DECLARATION OF INTERDEPENDENCE: POEMS FOR AN ELECTION YEAR. 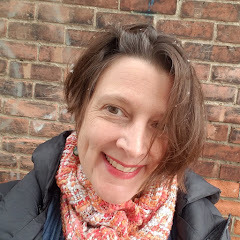 Please visit her website and blog. 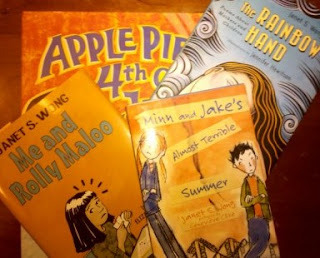 Janet has generously offered these four books as a giveaway for today's post readers. 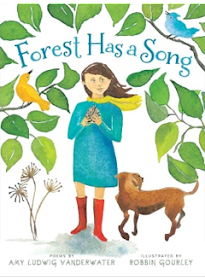 If you leave a comment in this post or in today's (April 2) post over at The Poem Farm, you will be automatically entered into a drawing to win. This drawing will close at 11:59pm on Thursday, April 5. Please leave brief contact information in your comment so that I can let you know if you win! Thank you, Janet, for this fantastic collection which includes: MINN AND JAKE'S ALMOST TERRIBLE SUMMER, THE RAINBOW HAND: POEMS ABOUT MOTHERS AND CHILDREN, ME AND ROLLY MALOO, and APPLE PIE 4TH OF JULY. I have much of my writing in notebooks, but there are also folders of notes or of pages I've liked that are 'ideas', & I have computer files of lists. I love that you have all this mess-& out of the chaos comes floss! Thank you for those lines of this little story, so amusing, especially the part about the 'decent family'-so true what silly things one thinks. And thanks for the ideas of inside/out. I will do it! Thanks Janet & Amy for hosting! Yes, hotel notepaper is the best. Thanks for the post and poem that made me smile. I'm set to get Janet's book -- yay! -- so no need to put my name in the hat. Thanks, Amy and Janet! I love hotel notepaper and those cheap hotel pens that leave big fat lines. Thank you to Janet for letting to see her "stuff" with a gentle sense of humor. I especially like how she describes what happens when she starts sorting the folder. Thank you for the exercise. Inside out writing sounds like a nice way is dissecting and putting back together a children's poem that could go from good to FANTASTIC. Thanks Janet and Amy for this!!!! Thank you for an enlightening peak! I look forward to using the inside out strategy with my students! It's always fun to see an author at work! Melinda: Please let us know how the Inside-Out exercise works with your students! Charles: Good to Fantastic is always a goal, but even going from OK to A Little Better works for me! Florence, Ms. Terje, and All: Thank you for viewing my exposed mess with friendly eyes! HA! Glad to know I'm not the only one who uses a hair for floss in a pinch! I actually like the second version the best.